Like all good elves at this time of the year, we’ve been working very hard in our classroom finishing a myriad of projects. Christmas activities are woven throughout our day but we’re managing our self-regulation pretty well. The Advent Calendar we started on Friday, December 1, nudged us from the green zone to the yellow zone; however, a few calming breaths with the smell of chocolate Santas in the air seemed to bring down the energy…sort of. 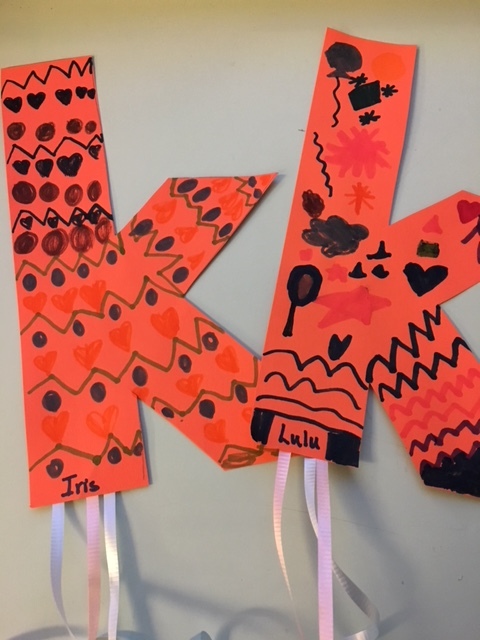 This week “K is for Kite” and we made some colourful kites to go along with our beautifully printed Ks – no easy task with all those lines sliding back and forward. We’ve noticed steady improvement and independence in our class’ printing and cutting skills. We can also see all that monkey bar swinging and hanging paying off for a strong upper body, shoulders, arms and hands necessary for good fine motor control. 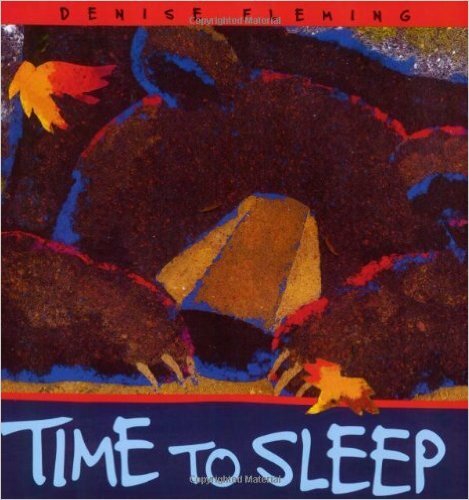 We read one of our favourite books, Time to Sleep, by Denise Fleming, and completed some fun activities with a focus on how seasonal environmental changes affect animals, such as migration and hibernation. 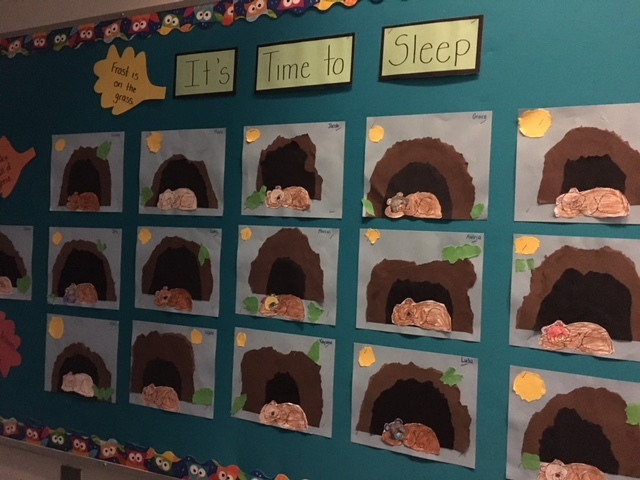 Recalling the main ideas and sequencing story events are two of the comprehension skills we are currently teaching in class. 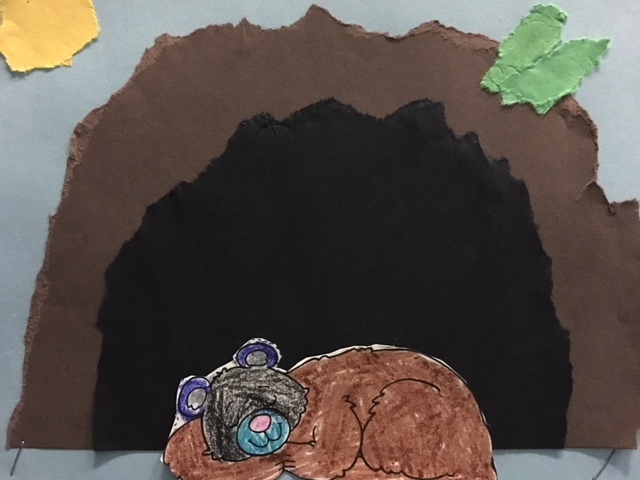 With our buddies, we completed a torn paper hibernating bear art project. In Math this month, we’re reviewing counting sets, including one to one correspondence, subitizing (recognition of a number set without counting), recognising number patterns on a dice and printing numerals with the correct formation. During PE we’ve spent a lot of time working on basic locomotor movements and following signals and commands. Signals and commands include following whistle signals (one whistle means freeze, two whistles means sit down on the spot) and verbal commands such as “find your personal space,” “listening line” and “listening circle.” We practise these every time we go to PE to ensure everyone is moving safely in the gym. The children are learning the difference between walking, jogging and running (we will focus on sprinting in the spring when we can go outside for PE). While jogging and running, the children are working on remembering to use their arms (“hip to lip”) as well. The children have been practising their skipping (step, hop on alternate feet), hopping (one foot) and jumping (two feet) and building endurance. Thank you to everyone who attended the Library Scholastic Book Fair and bought books. We receive a portion of the funds to buy new books and resources for our own library. Our big event this week was making our Christmas Marshmallow Balls with our Buddies. The sweet and delicious aroma of marshmallows wafted throughout the classroom, and this was another opportunity to strengthen fine motor skills as the children were threading sequins onto pins, through a mini marshmallow and into a styrofoam ball. We won’t say anymore as these ornaments will be a special Christmas gift for your Christmas tree. We did not take out Library Books last week due to the Book Fair. We will be back on the regular schedule this week. Wednesday is our Christmas Cracker project with our Big Buddies. We’re all looking forward to making some sweet treats to give to those less fortunate in our community. All children should have runners to wear indoors and for PE, and rainboots for outdoor playtime during the rainy days. We’re expecting dry weather this week, but please be mindful of the cool temperatures; a toque and gloves help keep your child warm and cozy for these end of Autumn days.